You can prevent users from uploading specific file types when they sync their OneDrive for Business files. This setting prevents file types from being uploaded but not downloaded. If users already have blocked file types in their OneDrive, the files will sync to their computer, but any changes they make on their computer won't be uploaded. 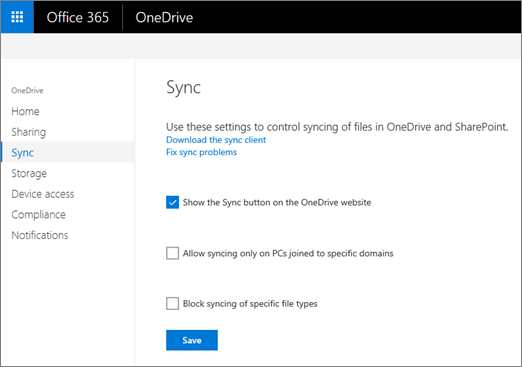 Open the OneDrive admin center, and click Sync in the left pane. Select the Block syncing of specific file types check box. Type the file name extensions you want to block, for example: exe or mp3. Do not include the periods with the extensions, or any other punctuation, spaces, or special characters.